Prosthetics has come a long way from its humble beginnings – the crude wooden legs of yore are a far cry from the technological marvels we can create to replace our limbs today. However, there is one thing that, with all our know-how, we haven’t yet been able to incorporate in them: a sense of touch. 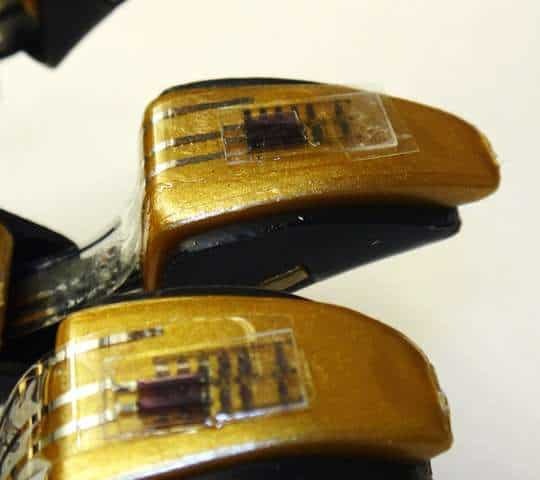 A research team from Stanford University aims to fix this shortcoming, and has developed technology that can “feel” when force is exerted upon it, then transmit the sensory data to neurons – in essence, they’ve created an artificial skin. Tactile sense is a very important source of information for our brains, and having an otherwise functioning limb that doesn’t feel what it’s touching is something most of us can’t even imagine. Sit on your hand till it goes numb, then try to tie your laces – it’s frustratingly hard, and personally, I find the sensation disturbing. Now imagine that numbness persists for your whole life. That’s what prosthetic users have to live with, a serious limitation imposed on even the most effective prosthetic. Without tactile sensitivity, it’s hard to maintain optimal motor control, and it’s impossible to know how much force you’re exerting on an object, or it’s temperature and texture, for example. To make matters worse, having a sense of touch (even the illusion of it) is one of the best ways to alleviate phantom limb pain, which affects nearly 80% of amputees. The human skin is a superbly complex and well tuned sensory organ – so much so in fact, that we may never be capable of creating something that reacts to stimulus in quite the same way it does. But the Stanford team, led by electrical engineer Benjamin Tee, recently performed a proof-of-concept experiment that brought artificial tactile sense from the realm of sci-fi one step closer to reality. 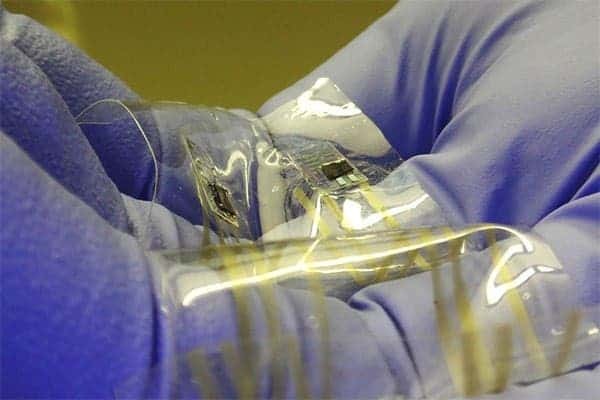 They used flexible organic circuits and innovative pressure sensors to create a skin-like interface that can sense the force of static objects. Data recorded by the device was transmitted via optogenetic to cultured mice brain cells. Their work was published in the journal Science. Artificial mechanoreceptors mounted on the fingers of a model robotic hand. The system, dubbed “DiTact” (Digital Tactile System) relies on low-power, flexible organic transistor circuitry, that can translate pressure into the same signals our natural mechanoreceptors generate. To make the sensors precise and to give them a wide enough range of pressure recording, the team created them out of carbon nanotubes shaped into tiny pyramidal structures. The nanostructure of the pyramids allowed the researchers to increase the sensors’ precision close to the levels of our own cutaneous receptors. But just having sensors isn’t enough, all the magic happens in the brain. To create sensation, the researchers took the signals from the piezometers and transferred them via optic cables to mouse cortical neurons – as the technology is still in an early stage of development, the cells were cultured in vitro rather than use the brains of live animals. But using the same technique, signals from a prosthesis coated with DiTact could be fed directly to the brain of a living human – optogenetics has been successfully used on live subjects before. All that is needed is for a number of neurons to be genetically altered to respond to light signals. Using a transgene obtained from certain algae strands, neurons can be made to fire electrical signals when exposed to blue light, or to yellow light using a bacterial transgene. However, because of the rate at which sensory information is processed by neurons, the team had to implement a few of their own changes to the classical method. Luckily, Chortos knew of the work of Andre Berndt and Karl Deisseroth who developed a new type of optogenetic treatment that allows brain cells to be stimulated very rapidly so that they’re compatible with the speed of real mechanoreceptors. Using the new optogenetic proteins, the neurons were able to sustain longer intervals of stimulation, suggesting that the system could also work with other fast-firing neurons, including peripheral nerves. This, the team says, means that DiTact will likely work with live mice or humans, and the good results they’ve seen up to know means that they will test the system on a live mouse as soon as possible. Nguyen notes that while the early work on sensory feedback with neurally interfaced prosthetics shows great promise, we need to truly understand how to effectively and safely stimulate nerves in order to provide realistic sensory feedback.